Tested in the Lab, Proven in the Field. CAMSS Shelters conducts rigorous testing of our shelters in US Government and Independent Labs and Testing Facilities. Examples of test facilities include US Army White Sands Test Center, Holloman AFB, McKinley Climatic Laboratory, and Aberdeen Proving Grounds. Testing is conducted to US Military standards. These standards include high winds, wind gusts, snow loads and extreme temperatures and, as importantly, the method for testing. For example, TOP military testing methods require wind tests to be conducted on the shelter from three different directions including from the end, the side and the diagonal of the shelter. Each test is run for 30 minutes and a careful inspection is made after each test to assure there is no damage to the shelter. Following the US Military test methods assures that CAMSS shelters are reliable and dependable in the field. Other testing includes durability, speed of assembly, ergonomics, blowing rain, and blackout. Even before testing begins, detailed engineering analysis and modeling is performed to verify shelter capabilities in extreme environmental conditions. Our testing informs our engineering analysis and vice versa so that there is a high degree of confidence in the design and engineering of all our shelters. 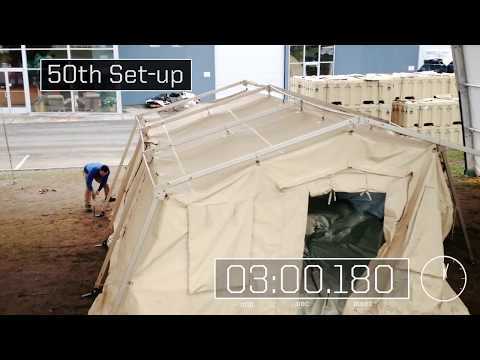 CAMSS Shelters has been deploying shelters to harsh and extreme environments throughout the world for over 30 years. This is successful real world testing which comes from a long and sustained history of providing shelters to demanding customers such as the U.S. Air Force, U.S. Army, U.S. Navy, U.S. Marine Corps, U.S. Coast Guard, U.S. State Department, United Nations, USDA, Homeland Security, large defense contractors and fortune 500 companies. Whether your project is in the extreme cold of the high arctic, the extreme heat and wind of the desert, or the humidity of the tropics, CAMSS Shelters can meet your need.